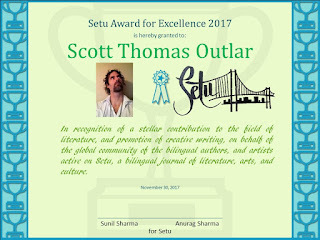 Setu is real honored in honoring these distinct signatures acting as a crucial Setu (bridge) between different nations and cultures through their unifying visions of humanism and liberalism in these toxic times. These are comforting voices. Setu awards for excellence, 2017 are being awarded to these four authors from across the globe for their uplifting works. The citations are being shared by the editorial board. Congratulations to these writers, who have always supported good cause, literary journalism, little press, and journals. We, indeed, are lucky and celebrating at Setu, the global community of artists, this great event. 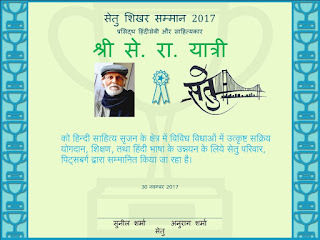 “This is indeed a pleasant surprise, and perhaps Sunil Sharma and Anurag Sharma have an uncanny ability of springing surprises. How can I ever repay their kindness for thinking of recognizing whatever talent that is there in a relative non-entity and underdog like me! 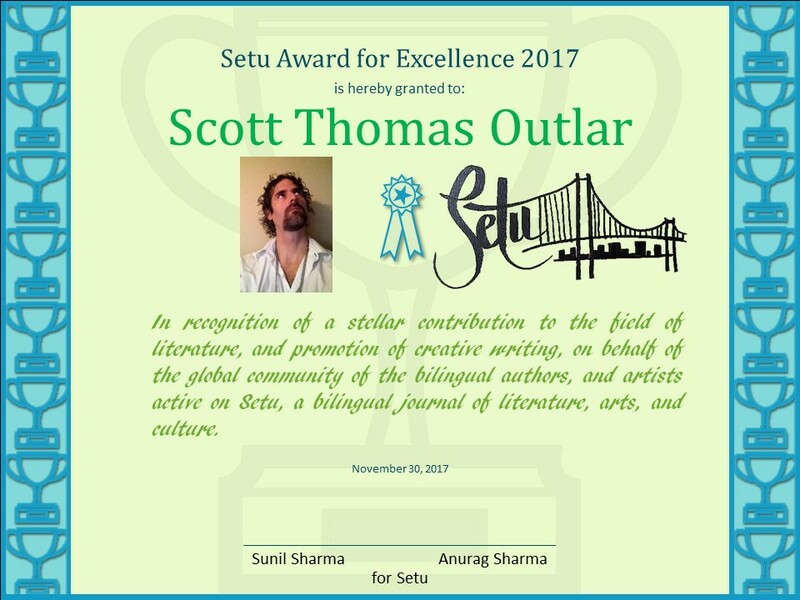 Thank you both and the Setu team. This is the first recognition I have received, and I will always cherish it. 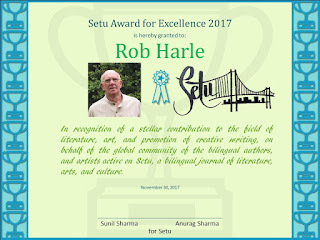 Honored to be in the company of greats like Rob Harle, SR Yatri and Scott Thomas Outlar. Gramercy! Gramercy! Gramercy!" I happened to see the announcement first on FB, a few minutes ago. And the above is the response I posted over there. Hearty congratulations to all the eminent scholars. 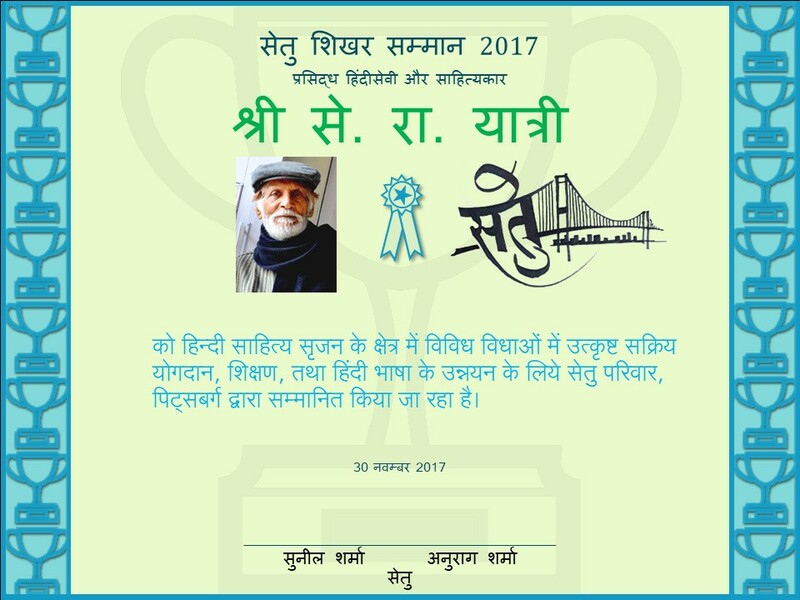 Heartiest Congratulations to all the deserving winners .